Wannabe artist and renowned conspiracy theorist Ahmed Zebidar vowed to jail Abla Fahita during a verbal exchange with the well-known puppet late Wednesday, shortly after filing a complaint against Vodafone Egypt over an online ad that he says reveals details of a bombing. Once again, Vodafone found itself facing an accusation related to national security over one of its ads, only this time Egyptian prosecutors took it seriously and have ordered an investigation into Zebidar's complaint. A statement by Vodafone said that the prosecutors summoned the company representatives for questioning concerning Zebidar's accusations. The company, however, didn't file any complaints against him. Vodafone described the accusations as "irrational." It said the advertisement's sole purpose is to "explain how to reactivate a Vodafone SIM card and attract audience to the product." "The advertisement carries no other meaning and any interpretation other than that is mere imagination or personal opinion of some of the audience," the statement read. A previous accusation related to national security against Vodafone was triggered over two years ago by crooner and music composer Amr Mostafa. He hinted during a TV interview that Vodafone's slogan "The power is in your hands" was actually a hidden message sent by the British telecommunications company to call on Egyptians to protest against former president Hosni Mubarak in 2011. 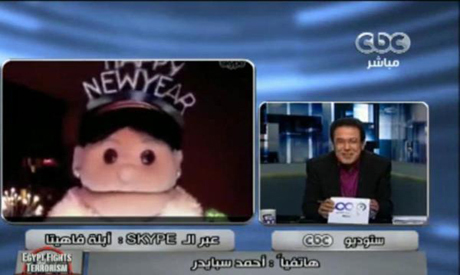 For his side, Zebidar, one of Amr Mostafa's ardent fans, demonised Fahita the old puppet and the main character of Vodafone's recent online ad rather than the mobile company itself. Zebidar – a tacky Egyptian pronunciation of the English word spider – believes that Fahita's utterance is barely comprehensible because basically she drops hints that bombings would take place. In a lengthy interview with TV presenter Ahmed Moussa on Tahrir TV late Tuesday, Zebidar pointed out that Fahita used the word 'bomb' during a previous ad for Dolce Ice Cream, and it was followed by several bombings in Egypt including the deadly one in Nile Delta's Mansoura recently. Explaining his own interpretations of Fahita's words and other "signs" in the Vodafone ad, Zebidar stressed January would witness more terror attacks, including the bombing of a shopping mall. He also believes the four branches of a cactus used as a Christmas tree in the ad symbolise the four-finger Islamist salute used by ousted president Mohamed Morsi's supporters. An ornamental ball dangling from the tree represents a bomb, Zebidar added. Late on Wednesday, another veteran journalist in Khairy Ramadan gave Fahita the puppet the chance to defend herself against Zebidar's accusations. "I am a mere comedic sarcastic character," Fahita said with her trademark tone on Skype before Zebidar, who phoned in, promised to send her to prison. According to Zebidar, the complaint he filed, which prompted Egyptian prosecutors to open an investigation and summon Vodafone representatives for questioning, was based on the same allegations he made during his interview with Moussa. When asked how he "reads" hidden messages in ads, the self-proclaimed singer and poet would stress that he knows too much about Freemasonry, which he blames for Egypt's disturbance over the past three years. Zebidar's previous TV appearances were mainly on Egyptian television channel Faraeen, owned by controversial talk show host Tawfiq Okasha. Zebidar's theories often instigate widespread sarcasm on social media. Lately, Egypt has been hit by a wave of bombings, with political tensions rising since the ouster of former president Morsi on 3 July. The Muslim Brotherhood, from which Morsi hails, was recently declared a terrorist organisation, and a myriad of its members face terror and espionage charges. Please help me understand the evil plot created by Vodafone, Obama and multinational corporations. Why would Vidafone need to use ads to deliver a message when it has been demonstrated that social media works just fine to mobilize people--remember that 25 January thing? Why would Vidafine warn people in such a hidden way of bombings to come? Why would it warn anyone at all, if it is directing bombings? And does it take a Freemason to predict that Egypt, sadly, is in for more violence in the near future? The real mystery is why the public prosecutor pretends to take this seriously. Ordinary Egyptians must be horrified that he is making a joke of the government in front of the whole world. After reading this new silliness, the majority of democratic nations in the world can no longer view the current rulers of Egypt seriously anymore. This is the height of stupidity and inanity.We are making Egypt a place full of mindless and foolish people.Worst is to follow when the stupids sitting in the prosecution office start investigations and send the puppet to prison for 15 days investigation.God knows where Egypt is heading..can anyone tell..? Far fetched as it all may seem it cannot be dismissed as pure conspiracy theory. The MB have been the tool which facilitated the attempt to destroy Egypts national sovereignty. Who backed the MB rise to power? Obama and co. are certainly high on the suspect list. Who financially backs the Obama administration? Who benefits by the collapse of sovereignty and globalisation of the economy? At the upper echelons of MB pyramid of power, who sits at the top and to whom are they connected financially or otherwise? Can we say, a common agenda? Joining the dots, some multinational corporations would indeed appear to be an essential part of the big picture, with their strange "double entendre" advertising, and social networking as they appear to have been all along. This is the kind of paranoid idiocy that so many of our people seem to have these days. A media that lies shamelessly and a group of poorly educated, hate-filled citizens, irrational thinking citizens who resort to empty conspiracy theories to justify unjustifiable actions. These are the Mubarak-style lies that tie in Israel, Iran, hamas, America and the Brotherhood as some kind of grand alliance. Sigh.